On a limited exploration budget, Mining Projects Group (ASX:MPJ) continues to pinpoint successful drill holes in the Kambalda nickel region of Western Australia. On the back of new results from two methodically placed diamond drill holes, a 40km strike zone has just been linked together, essentially unlocking the prospectivity of the entire strike zone. With the confirmation of lava channels at both ends of MPJ’s 40km strike zone, the body of the strike zone between the confirmed lava channels is now significantly more prospective. How many more nickel sulphide laden lava channels sit in-between what we have seen to date? The evidence of the new lava channel appears to have spurred the company into a major expansion of the Roe Hills Project – they will now explore and drill strategic targets along the whole belt. We first invested in Mining Projects Group (ASX:MPJ) back in May of 2014 when we wrote about Nickel Rock Stars Working For Shares: Twiggy’s # 1 Geologist Plus Sirius Masterminds Combine in One Fraser Range Micro Cap. We don’t consider MPJ to be another Fraser Range nickel play – MPJ’s primary focus is the Roe Hills Nickel Project in Western Australia’s well-endowed Kambalda nickel region. 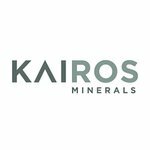 The Kambalda region is home to globally recognised nickel discoveries such as Cosmos, Prospero, Sinclair, Cerberus, Silver Swan and Camelwood. You can see where Roe Hills is on the map below – to the east of Kalgoorlie. 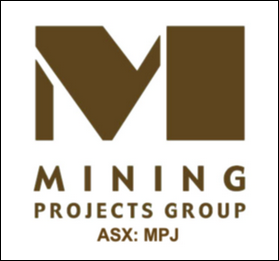 Newexco, the same geophysics team that helped identify Nova-Bollinger, Flying Fox and Spotted Quoll along with several other major WA nickel discoveries is working for MPJ, and continues to work with MPJ’s chief nickel hunter Neil Hutchison as part of the nickel rock star team... this rock star team is committed to MPJ and taking partial payment in MPJ shares. Let’s take a look at the multiple prospects within MPJ’s Roe Hills Project – you can see them in the next map below. At the southern end you have Talc Lake with numerous nickel sulphide intersections and at the northern end you have Roe 1 where a massive lava channel has just been defined. MPJ Confirms Nickel Sulphide Intersection with Major Strategic Target Found. Last we wrote about MPJ in late 2014, drilling at Talc Lake confirmed multiple high-grade zones of nickel mineralization and reiterated the prospectivity of existing strategic geophysical targets. 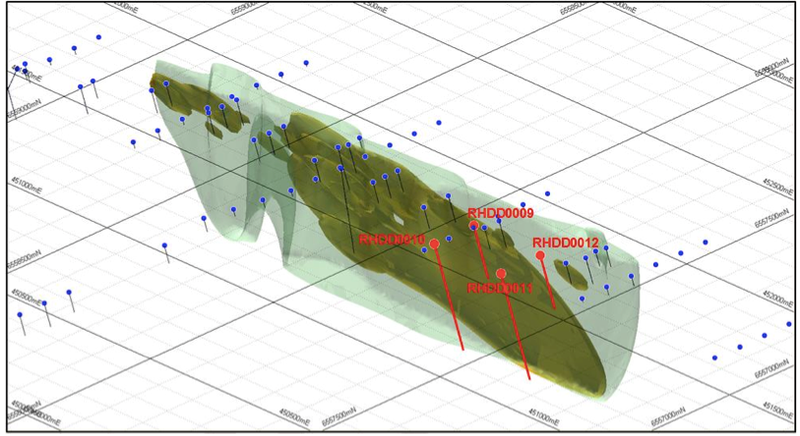 Eight holes had been drilled at the Talc Lake prospect and diamond drill hole RHDD0008 intersected nickel mineralisation over a down hole depth of almost 2m, occurring as a series of pyrrhotite-pentlandite sulphide blebs and veins. Individual blebs returned nickel grades of up to 2.3% Nickel using a Portable XRF Analyser. Regular readers of our sites will be familiar with our long-standing interest in high potential stocks. Did you see our Next Tech Stock article on Ziptel (ASX:ZIP) ? ZIP has been up as high as 160% since we first released our article. Since the Next Tech Stock article on Connexion Media (ASX:CXZ), Tiny ASX Company to Supply Tech to GM and Volkswagen: Potential $50BN Market by 2018? , CXZ has risen as high as 80%. Since the Next Tech Stock article on Collaborate Corporation (ASX:CL8), ASX Listed Tech Company Set to Capture Global Mega Trend , CL8 has been up as high as 60%. The past performance of this product is not and should not be taken as an indication of future performance. Caution should be exercised in assessing past performance. This product, like all other financial products, is subject to market forces and unpredictable events that may adversely affect future performance. MPJ is applying what’s known as the “cabbage leaf” model for its Roe Hills exploration, and drilling results to date continue to conform to this model. This model represents the kind of lava flow that happened billions of years ago in the region. Volcanoes erupted nearby and molten hot lava channels carved across the land – the heavy material – like nickel sulphides – was not carried far and dropped out, whilst the lighter stuff kept flowing over large distances. What MPJ are looking for is where that nickel sulphide laden material dropped and sunk to the bottom of the lava channels. The base of the lava channels ultimately forms the base for large nickel sulphide deposits. This cabbage leaf model is the same model that was used to discover the Cosmos, Prospero, Sinclair, Cerberus, Silver Swan and Camelwood deposits in the Kambalda region of WA. The red lines and letters are of MPJ’s four new drill holes at Roe 1, while the blue pins are historic shallow drill holes that previously identified the anomaly there. Both holes, RHDD0009 and RHDD00100, show elevated Ni-Cu-PGE geochemistry and intersected a thick lava channel comprised of lizardite ultramafic rocks – the kind that are consistent with previous nickel discoveries (Cosmos, Prospero, Sinclair, Cerberus, Silver Swan and Camelwood). A third hole was only partially completed due to equipment failure – it terminated within the ultramafic lava channel above the base where nickel sulphides would likely accumulate. This third hole, along with a fourth (holes 11 and 12) will be completed first up in next round of exploration – this should occur imminently in the coming weeks and months. We would expect MPJ to attract additional capital to carry this work out. Down Hole Electro Magnetic (DHEM) surveys on each of the four holes once all have been drilled will also be conducted. 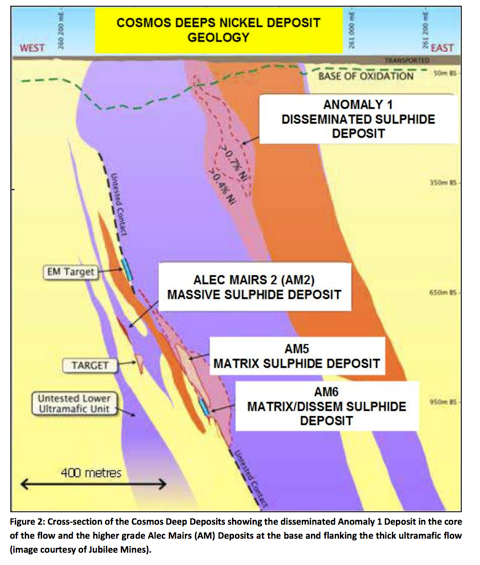 The image above is a cross section view of the Cosmos Deeps nickel sulphide deposit 40km north of Leinster in Western Australia. It’s part of the Cosmos nickel project owned and operated by Xstrata, which produced 12,000tpa until closure in 2012. The lava channel MPJ has just uncovered at Roe 1 is comparable to that at Cosmos; both have what’s known as a thick lizardite serpentinite system bracketed by thick ultramafic flow. At Cosmos, the core of the system contains large low-grade disseminated nickel sulphide above massive nickel sulphide deposits. These are the results of early ultramafic pulses depositing high-grade nickel sulphide mineralisation at the base and on the flanks of the ultramafic system – basically lava flows that resulted in a pool of nickel mineralisation. Again the so-called “cabbage leaf” model comes into play with one nickel area flowing into the next, so armed with this, MPJ is going to be looking for a Cosmos style resource at Roe 1. 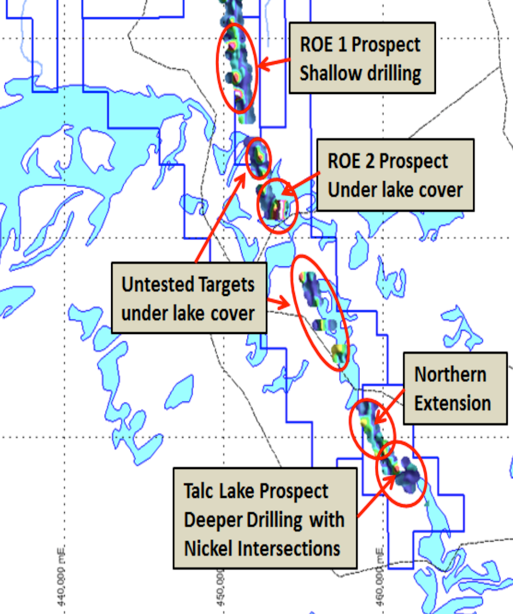 MPJ has now drilled 8 Diamond Drill holes at Talc Lake and 2 at Roe 1 and hit its targets one after the other. So who’s responsible for this accuracy? The key man at MPJ’s exploration effort in the Fraser Ranges is Neil Hutchison – he’s Andrew “Twiggy” Forrest’s “nickel man” and the GM of Geology at Poseidon Nickel Pty Ltd.
Neil made a big find at Poseidon in his first year there – the biggest discovery for Poseidon since 1971 – the 68,000 tonne Cerberus nickel deposit. Given the track record, Neil is clearly a gun nickel explorer – and he has agreed to be partially paid for his services to MPJ in shares, not cash, so his success is tied the company that we’re also investing in as a long-term play. A find like Cerberus could multiply MPJ’s lightweight market cap several times over, and while there’s always risk in these kinds of ventures, Hutchison taking shares over cash shows a lot of confidence in MPJ’s plans and the prospectivity of the ground. 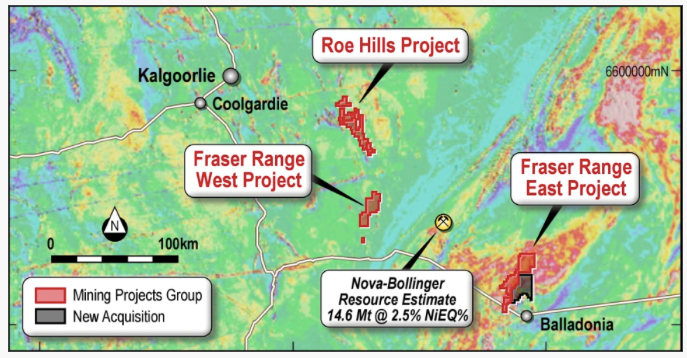 Neil and MPJ are also teaming up with renowned nickel geophysicists Bill Amann and Adrian Black from Newexco who were behind the world famous nickel discoveries of Nova and Bollinger in the Fraser Range, plus Panoramic Resources’ recent intersect of 89.3m at 1.6% nickel, amongst others. The Newexco team are backing MPJ with their wallets too, taking shares over cash. So with a team heavily invested and dependent on a successful outcome, it stands to reason that they aren’t mucking about, spending willy-nilly on chancy targets. These blokes have applied methodical and proven exploration techniques on MPJ’s ground and set up a range of high quality targets and gone bang, bang, bang, hitting each in the bullseye. MPJ now has two strong leads at its Roe Hills Nickel Project – Talc Lake with multiple nickel intercepts to expand upon, and now a new lava channel at Roe 1 to explore. 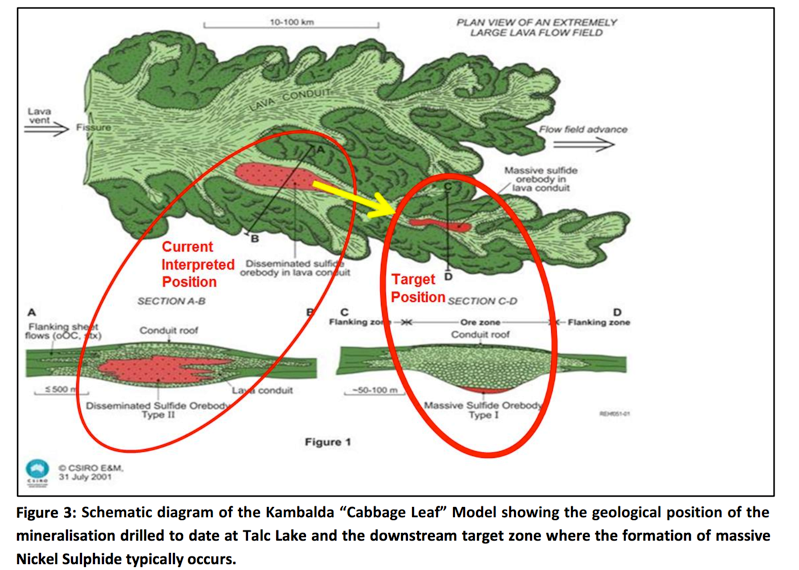 Talc Lake is at the southern end of MPJ’s ground while Roe 1 is at the far northern end, and the presence of lava channels in both areas not only fits the “cabbage leaf” model, it also increases the prospectivity of the whole 40km strike zone. We expect work to continue apace for MPJ in 2015 with Down Hole Electromagnetic surveys to complete on its first two holes at Roe 1 and the other two to finish. MPJ will need to attract new capital to continue with this exploration, but given what we have seen to date we believe this wont be too hard to find. In the coming weeks and months, we should see a clearer picture of what’s under the ground at Roe Hills and hopefully get some more drilling targets worked up through geophysics later in the year. We’re also waiting on downhole survey results for Talc Lake, and will be keen to see what MPJ does there next. MPJ’s track record so far has been as accurate as a Swiss watch – so we don’t mind waiting! Have you heard about the Next Investors VIP Club? Joining this Club will give you free access to opportunities not normally available to general retail investors – however you must qualify as a sophisticated investor under Section 708 of the Corporations Act. Just fill in the form and you will be alerted to the next opportunity.